Geography Cat’s friend Erik sent this card into the Project from Christmas Island. Thank you Erik. Christmas Island is located in the Indian Ocean, northwest of Australia and south of Indonesia. The tsunami happened because of the displacement of water caused by the eruption of Anak Krakatau. Similar to dropping a stone into a puddle, the water underneath the stone is displaced and this causes ripples to radiate out; in this case, the mass of rock from the eruption fell into the water in the Sunda Strait and caused the radiating tsunami to travel at high speed and without warning. There is a good article about it here. The tsunami has killed at least 430 people and displaced a further 20 000. The Indonesian authorities have imposed an exclusion zone as there is still a chance of more volcanic activity and rock slides, and therefore of more tsunami. 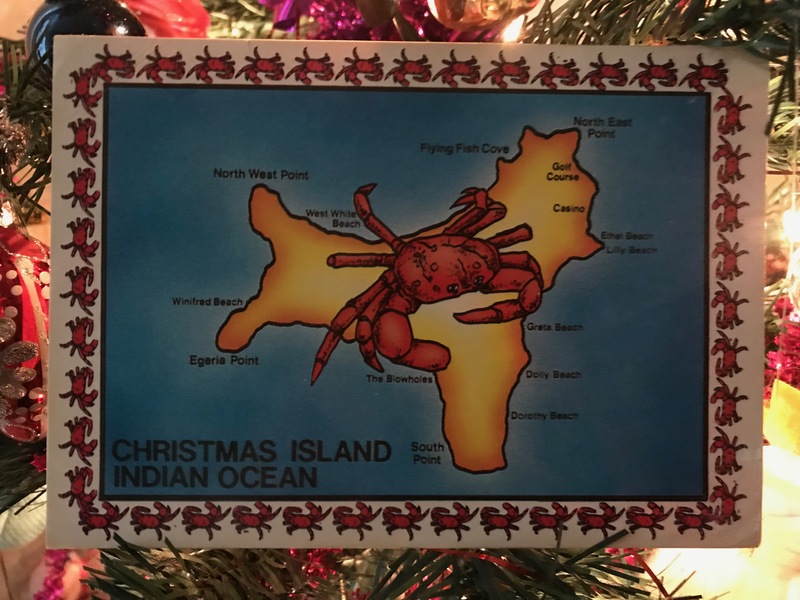 Christmas Island is far enough away that it was not affected by this event, but close enough on the map that Geography Cat wanted to mention it. Most people know that Christmas Island is so-named because it was “discovered” on Christmas Day, although they might not know which year. 1643. Captain William Mynors of the East India Company sailed past it on that day and decided to name it, although not to land there. Actually, Captain Mynors wasn’t the first European to discover the island. That was Captain Richard Rowe, back in 1615. And it seems entirely possible that non-Europeans had seen the island prior to that. The earliest recorded landing by a European wasn’t until 1688 when explorer and ex-pirate William Dampier sent two crew members out from the English ship Cygnet. The landing party reported the island as uninhabited and not much happens again until the late 1800s when the island is explored more thoroughly and a small settlement is formed in the north. Christmas Island was invaded and occupied by Japan during the Second World War. The majority of the population was transported to prison camps in Indonesia, leaving only 500 Chinese and Malayan workers until the island was repopulated in October 1945. Control of Christmas Island passed from the UK to Australia in 1958. The population is now just under 2000 people. September 2018 saw the closure of the Christmas Island Immigration Reception and Processing Centre, which was a detention centre for refugees and people seeking asylum in Australia. That detention centre housed nearly 3000 people at times! The major industry of Christmas Island has been the mining and export of phosphate. The phosphate is used as a fertiliser in Malaysia, boosting the fertility of soil in plantations that have been created where rainforest once grew. The phosphate itself comes from guano, the massive accumulation of bird excrement. The major industry today is tourism. Many tourists visiting Christmas Island will be interested in witnessing the wide species diversity of the island. This diversity was made possible by the fact that Christmas Island has only recently been populated (late 19th century), and hopefully, its relative inaccessibility will limit tourist impact. Some tourists visit specifically to view the seasonal migration of the red crab. Barriers are erected by the roadside and there are even tunnels and bridges for the estimated 40 000 red crabs to reach their preferred spawning grounds safely. You can read more about this and see some great photos here. In diagram 4 of the above sequence, the dark grey rock is basalt, and the light grey rock is limestone. Thank you again to Erik for sending his postcard to Geography Cat. What an amazing place! Seeing the red crab migration would be astounding! Thank you for such an informative piece. I have very much enjoyed reading about Christmas Island. An incredibly interesting read. Tsunamis, to atoll reef formation and political history. It is good to see that conservation of the land dwelling Christmas Island red crab (Gecarcoidea natalis) is happening too.